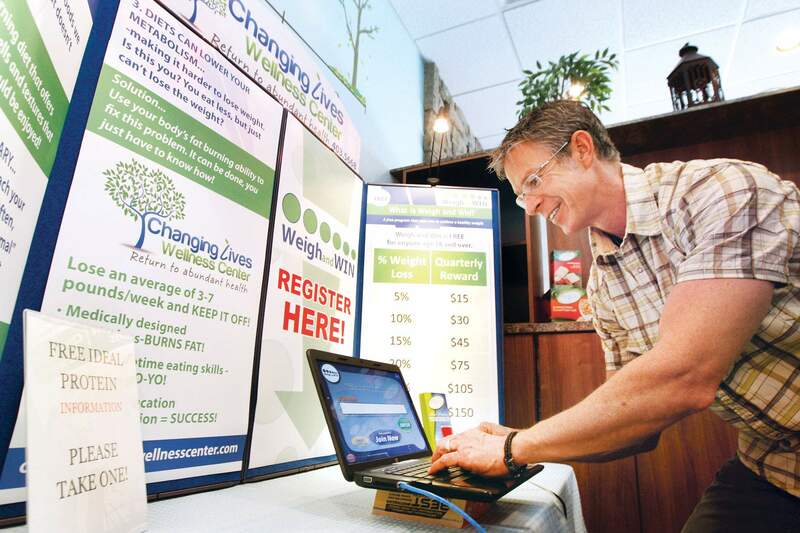 A local Weigh and Win kiosk is at Changing Lives Wellness Center in Durango. Chiropractor Christopher Greene said he supports the program because obesity is a major factor in his patients neck and back issues. Participants can earn as much as $165 in the Weigh and Win program. Its not every day that people who want to lose weight can get paid for purging themselves of pounds. But Kaiser Permanente is compensating people in cash  including nonpatients and out-of-area residents, including Southwest Colorado  for losing weight. Payoffs end when participants reach their fighting trim  defined as a body mass index, or BMI, of less than 25. The Kaiser program, Weigh and Win, is not to be confused with the current 14-week Lose to Win weight-loss contest sponsored by The Durango Herald now in its second year. Participation in the Kaiser program is done electronically through a kiosk  a stand housing a computer, keyboard, screen, camera and scales. Program participants identify themselves, input personal data, step on the scales and get their picture taken. The information is sent electronically to the data center of incentaHEALTH, a corporate health-program provider that manages Weigh and Win. 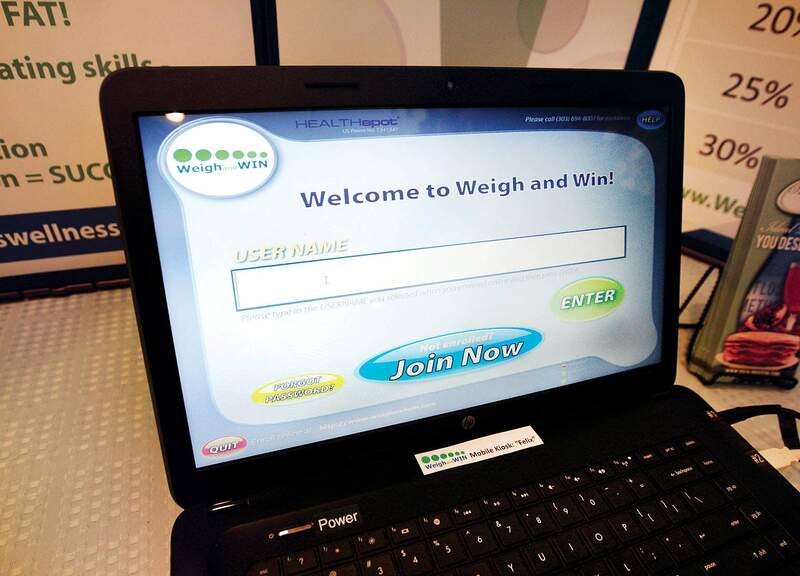 Amy Whited, a Kaiser spokeswoman, said Weigh and Win is one of several lifestyle-enhancing programs the nonprofit supports. Among them: Live Well Colorado, which is dedicated to reducing obesity, and Denver Bicycle Sharing. Kaiser puts up the weight-loss reward money. There are 42 kiosks, valued at $7,000 each, throughout the state at health clinics, recreation centers, libraries and private businesses, including eight at American Furniture Warehouse locations. Whited said more than 28,000 people have enrolled in Weigh and Win. In La Plata County, portable Weigh and Win equipment is housed at Changing Lives Wellness Center, 1145 South Camino del Rio, No. 120, operated by chiropractor Christopher Greene. Greene, the only Weigh and Win sponsor in Southwest Colorado, will take his equipment to businesses that want to encourage employees to maintain a healthy weight. The use of kiosks is free for the time a person is enrolled in Weigh and Win. Based on the information they supply when signing up, participants receive a daily email containing a suggested grocery list and personalized tips for nutrition and exercise. The suggestions are based on three meals and three in-between snacks a day. Our goal is a healthy lifestyle, not a yo-yo diet, said Katie Haas, a program manager with incentaHEALTH, whose salary is paid by Kaiser. Greene offers a weight-loss regimen based on Ideal Protein pre-packaged high-protein meals. Patients eat four meals a day, starting with three Ideal Protein packages and one they prepare based on suggested meal plans. Gradually they substitute home-prepared meals for the pre-packaged ones. The concept, Greene said, is that they learn to make a lifestyle change based on personal results. Only people with a BMI of 25 or greater may participate. Patients weigh in every three months, with rewards ranging from $15 for a 5-percent weight loss to $150 for a 30 percent loss in three months. Lets say a person weighing 250 pounds loses 5 percent of his original weight every three months for a year. The payoffs would be $15, $30, $45 and $75, a total of $165. If the participant continues, his base weight for the second year would be 200 pounds. Monetary rewards continue until the BMI limit is reached. A BMI is calculated by dividing ones weight by ones height in inches squared and multiplying by 703.